Everything in help desks revolves around tickets. Every time a customer sends a request to your support channel, a ticket is created to track the conversation. But over time, your ticket volume begins to grow. Before long, you’re swamped in tickets you can’t keep track of. Without a ticket sorting system, finding tickets becomes messy and overwhelming. Let’s see how these four products allow users to organize tickets. Freshdesk uses filters to sort its tickets. These filters, called “Views,” can be customized and then accessed from a handy sidebar that appears alongside the feed. Anyone can make personal Views, but Views shared across the team are managed by admins. The ability for all users to create personal Views is a huge advantage. A customer service rep could create a View of all tickets related to their product’s new chat feature without having to ping their supervisor to get permission. Freely editing the ticket list gives users great autonomy to minimize time and effort spent sorting tickets. Companies that empower their support reps to proactively help customers will love the ease-of-access of Freshdesk Views. Help Scout ticketing revolves around mailboxes, each of which is bound to an external email. Mailboxes organize tickets by the email channel they came through. Within a mailbox, tickets are categorized into folders. Folders can be visible for the entire mailbox or select users. Mailboxes are an intuitive way of categorizing tickets if your team runs multiple support emails. The head of support could use mailboxes to distinguish between internal tickets and customer tickets. But folder organization makes for a less flexible sorting system than filters. Instead of checking boxes in a sidebar, an agent must set up a series of “if…then” conditions in the mailbox editor to make new folders. Not being able to edit ticket organization directly from the ticket list is a huge hassle and a considerable disadvantage. Zendesk also uses Views to organize its ticket list. Any Zendesk user can create new Views by setting up a series of ticket conditions. They can then access their Views to the left of their feed. Listing all Views next to the ticket feed makes it very convenient to switch between Views in Zendesk. But its ability to customize the ticket list falls short of Freshdesk. Since Zendesk Views have to be set up on a different screen, complex Views that filter for specific criteria are much less convenient to create. 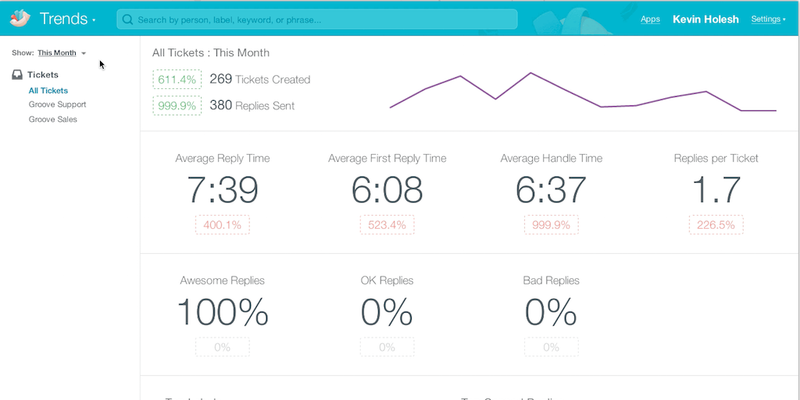 Groove’s ticketing resembles an email inbox. On the sidebar, Groove lists all mailboxes and folders as tabs. Users can change the ticket list by opening a different folder. New folders are made by admins only, and like Help Scout and Zendesk, they rely on conditional triggers to catch tickets. Groove’s mailboxes are easy to switch between. Consequently, so are its folders. People on multiple support teams will find the ability to tab between mailboxes helpful. However, since only administrators can modify folders, support teams must share the same mailbox setup. Groove’s UI is compact and functional, but its ticket management customization is lacking compared to the others. Which help desk has the best ticketing system? Freshdesk’s filter bar is what sets it apart in ticket management. The advantage of Views is the ability to modify the ticket feed directly instead of sifting through folders. Freshdesk’s filters offer users extra flexibility in controlling the ticket feed and make saving Views simple. There are a lot of menial chores that go along with resolving a ticket. Your team faces the mind-numbing endeavor of prioritizing tickets, assigning them, closing them, reopening them after a pending update, sending customer surveys after 48 hours, and on and on. Help desks can accomplish these tasks automatically for you, but some do it better than others. Rule automation can be accomplished in many different ways. Individuals can make a single command to carry out multiple actions with one click. Admins can make overarching rules that run every hour to assign tickets. We’ll examine to what extent each help desk allows agents and admins to tailor automation for their workflow needs. Dispatch’r sorts, prioritizes, and assigns tickets. Supervisor executes time-sensitive rules, like closing a ticket after 48 hours. Observer executes rules triggered by events, like notifying the boss after a bad customer rating. 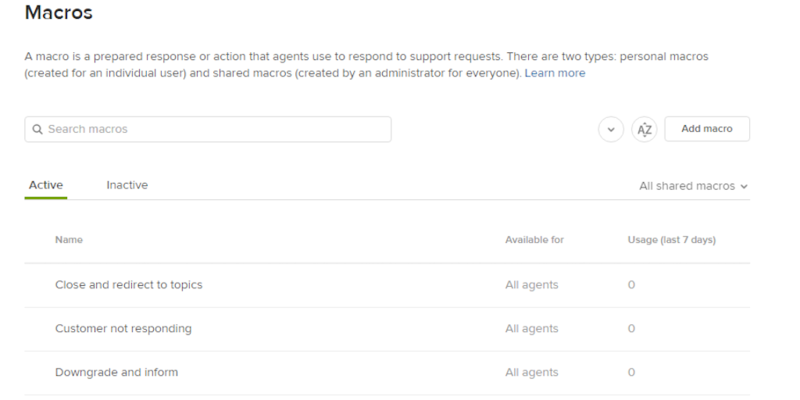 Admins can create “scenario” automations for their agents. Scenarios can only be executed under certain circumstances. A scenario automation that closes refund requests will only be visible on a refund request ticket. Dividing automation by function makes it conceptually easier for admins to understand. Freshdesk’s weakness is that automation editing is open only to admins. Agents have to rely on top-down management to streamline their workflow. Help Scout automations are called “workflows.” Workflows are mailbox specific and aren’t divided by function. Only admins can edit workflows by default, but agents can be given permission to edit them for their respective mailboxes. Since workflows are mailbox specific, they are inherently specialized for certain teams. Agents in the same group can help each other by making useful workflows. The only weakness to Help Scout’s mailbox scheme is that there’s no global automation, so workflows must be copied from mailbox to mailbox to apply universally. The above are for admins, but any Zendesk user can make “macros.” A macro will automate processes to execute all at once with one command. A macro could automatically close a ticket and send a follow-up email for example. Zendesk makes automation accessible to all users. Keeping macros separate from admin automation allows agents great freedom in streamlining their processes themselves. Admins have a range of different automation to choose from, and agents have complete autonomy to make macros without permissions. Groove’s automation are called “Rules” and only admins can make them. Rules are mainly for sorting incoming tickets, and they lack time-sensitive automation. The conditions that can be customized in a Groove rule are few compared to the other help desks. As Groove is about core functionality, its automation isn’t extensive. There is no option for individual automation. Which help desk has the best automation? Zendesk’s range in automation is why it wins the category. Individuals have direct access to personal macros while admins can still create software-wide triggers that act on all tickets. Analytics can prove what intuition only guesses at. Writing a better email template becomes much easier when you know which messages customers always rate highly. Without reporting analytics, the root cause of problems will be untraceable and customer preferences will go unrecorded. But good measurements aren’t enough. Customizing what data you gather and report is necessary if you want deeper insights specific to your business. 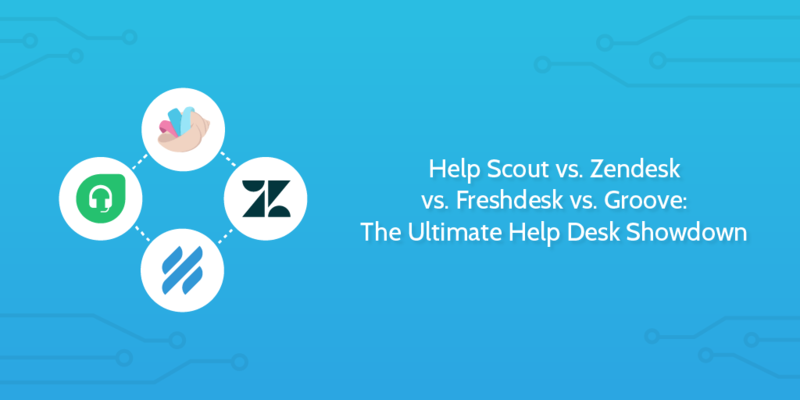 These four help desks have very different methods to let you approach data on your own terms. 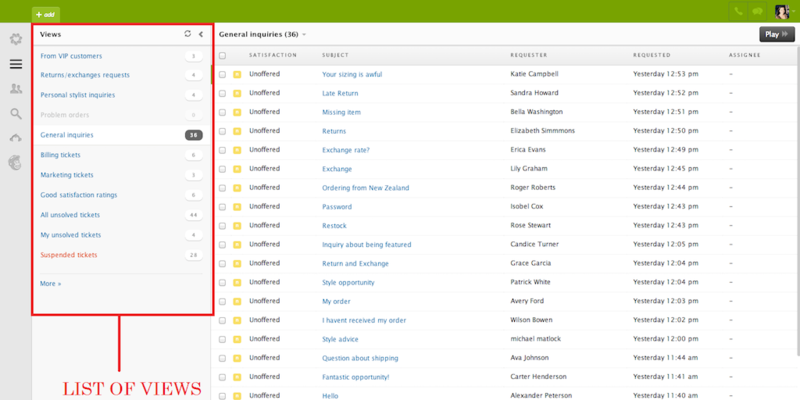 Freshdesk offers report customization with up to eight preset data filters. A report and all filters applied to it can be saved as a custom report. 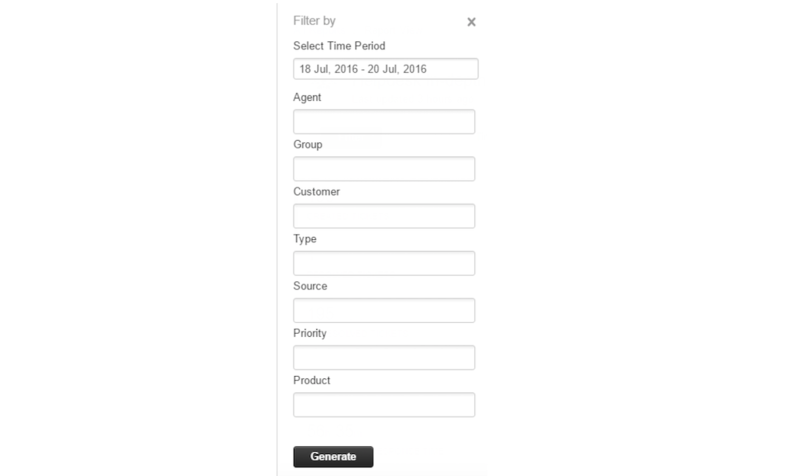 Custom reports can be loaded from the drop down menu, so filters don’t have to be reapplied. You can also schedule reports, default or saved, to be sent as periodic emails. The filters make saving custom reports easy, and scheduled email deliveries are useful for keeping all team members informed. Freshdesk’s filters offer a decent amount of report modification. But since all data filters are preset, report customization in Freshdesk is limited. Help Scout allows you to modify reports with data filters called “Views,” which are created by adding search fields. Views can filter ticket’s by preset fields such as type, tag, mailbox, and folder, but they can also filter custom fields. Views can both include relevant data and exclude particular information. Views are a very versatile search tool. But Help Scout cannot schedule report emails, nor do its custom fields compare to the depth of Zendesk’s data customization. Zendesk lets you export custom ticket Views as ticket reports and distribute them by email. Members of Zendesk’s Professional plan and higher have access to Zendesk Insights, with which users create custom reports by choosing metrics and graphs. Admins can even make custom data fields to be analyzed. All Insights reports can be scheduled for email distribution. The ability to use the information Views to make reports allows any user to share their angle on a problem. A support rep could create a custom ticket View about a problematic client and share it with the team for response advice. What’s truly great is Insights’ custom reports feature, which is unmatched in the level of interaction it allows with data. Groove presents all ticket data in one place. Data can be filtered by mailbox. Groove charts the number of customers served over time, and below the graph are its eight metrics. Four measure response time and four count customer ratings. Clicking on each metric will reveal a more detailed breakdown of the data. The data Groove presents is concise but limited. A small business without many customers may find Groove’s reports adequate. But a large business that wants to compare average resolution time against ticket traffic trends had better head elsewhere. Which help desk has the best analytics? The ability to turn ticket Views into reports exemplifies Zendesk’s high custom reporting capabilities. But the power to create custom data fields and custom reports is why Zendesk takes this category. Zendesk wins because it allows a great range of customization to both agents and admins. The other softwares have unique features like Helpscout’s intuitive mailboxes and Freshdesk’s filter bar, but Zendesk is the help desk most malleable to your needs. If you’re looking for a help desk that employees can mold into their personal support solution, Zendesk is your best option. You can also check other Zendesk competitors if you are looking for more options. We’d love to hear about the different ways you use different help desk software in the comments. Who knows? You may even get featured in an upcoming Process Street article! Great breakdown! We have actually invested weeks of time trying out all four of these options. In the end we settled on Helpscout for supporting customers at http://GhostBrowser.com and http://WPinline.com. The reason was something not discussed here: the WordPress, specifically WooCommerce integration was the best. Helpscout uses the client’s email address to pull all of their WooCommerce orders into the conversation. Saves us tons of time. Thanks for the insight! That’s useful for any WooCommerce user to know when selecting a tool. Useful comparison! Zendesk looks good! I like it! Thank you! Since after writing this, we’ve actually found the most success with Intercom. Since we’re a SaaS company, we can link together the app usage metrics and the user profiles with the incoming tickets. Plus, it has great integrations. To me it’s always been a choice between desk.com and Zendesk. The other like helpscout are great for smaller companies. Thanks for commenting. I’ll look into desk.com, especially if it’s more suited to larger organizations. I don’t think Desk.com would be an option to consider, at least for a long-term project. Even if we have been using it for years at https://slidemodel.com/ they will retire the product in 2020. I recommend looking for other good alternatives. Great write up! When we did our review of Groove, it was early on in using the service. It has been a couple of years using it now and we still are on the platform. I have been disappointed with their release cycle of new features, especially a mobile app. Besides that, we do love the simplicity and the fact that it looks and acts like normal email for our customers. Thanks for the comment. We love Intercom for the same reason. It feels very personal, and it’s also connected to our app’s metrics so we can see exactly what the user has done and what they’re talking about. I really like Zendesk, but the one thing I would change is the ability to export searches as an Excel file. Other than that, I’ve been pretty happy with it for the past year we’ve had it. Great comparison here. I probably agree with the winner, so many features. But I think it might be too much for small companies. I’d use something like Deskun for small teams. Thanks for the comparison, Vinay! Zendesk would be a superb option but please be advised (and not waste weeks setting it up) that CC is not working like on emails (which leads to potential breaches) BCC is not working at all (there is an option to do it with extension but it has flaws) and finally attachments to emails are not possible. Files go as public links. If your client add another person in CC, the person can get the files from the link. Things with CC has not been resolved for ober 5 years now, and Zendesk responded that they nothing about it. If your help desk base mostly on clients sending emails, then Zendesk possibly will not satisfy you. Hey Piotr, thanks for commenting with those interesting considerations. I think that’s the kind of thing people will unfortunately find out after a lot of time and energy has already been wasted.